With all the "Antinomian" (a.k.a. "anti-Law") flavored talk on social media lately that completely boggles the mind when it's coming from Lutheran Pastors who should know better, I thought it might be good for us to get back to basics and revisit the Ten Commandments. Remember, as Lutherans, we firmly believe that a proper distinction between Law and Gospel is vital and that the Law is good just as the Gospel is good. Here is the tenfold sure command, God gave to men of every land, through faithful Moses standing high, on holy Mount Sinai. Have mercy, Lord! This [article] will help you study the Commandments and use them in your daily life. We recognize sin in our lives as we examine ourselves according to the Ten Commandments. Sin takes a gift God has given and uses it in a way God does not want it used. 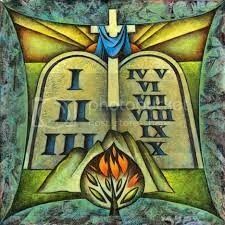 Each commandment also teaches us how God’s gifts are used to His honor and glory. 8. You shall not give false testimony against your neighbor. A lying witness never be, nor foul your tongue with calumny. The cause of innocence embrace, the fallen shield from disgrace. Have mercy, Lord! Our good reputation is another gift from God. God gives some the duty to judge behavior and to punish evildoers, but if that is not our calling in life, we have no right to tarnish other people’s reputations. We have the duty to speak in such a way about individuals or situations that we are putting the best construction on them and speaking about them in the kindest possible way, even as God treats us kindly, with mercy and compassion, through Christ our Lord. (Ephesians 4:25; James 4: 1 1; 1 Corinthians 13:7; 1 Peter 4:8). That's a good, succinct summary for us. However, in an attempt to make it a little more personal (and uncomfortable) for us, let's consider some specific examples of what would classify as "breaking" this Commandment as put forth by Rev. Dr. Ken Korby from a piece titled "The Ten Commandments Preach Repentance; That Is, By Them God Shows Us Our Sin And How Much We Need A Savior" that I found at the Steadfast Lutherans website. -- Have I told the truth in court or in school before authorities or before my parents when I knew the truth? -- Have I been afraid to bear witness when I knew the truth and it was necessary to speak up against a wrong-doer or to speak for a victim? -- Have I gossiped, delighted to tell others about the faults or mistakes of another, excusing myself especially by saying that I spoke only the truth? -- Have I gone to others to make peace if I wronged them or they me, or to correct them if I knew of their wrong? -- Have I flattered others, or put on a front to make them think of me differently from what is true? -- Have I slanted stories to my benefit or deceived others by withholding some evidence of the story? -- Have I found ways gladly and willingly to explain, in the best possible way, those words or actions of others that hurt me? -- Have I defended my neighbor when things said about my neighbor have made others think badly about him or her? -- Have I learned to hear with the weaknesses and faults of others, covering their shame? -- Have I been faithful in keeping the secrets of another’s heart entrusted to me in confidence? Surely, each and every single one of us has fallen short of living up to those standards, haven't we? Of course, recognizing how we fall short of God's perfect Law, and then repenting of those sins, so that we can receive His forgiveness and mercy offered to us freely through the death and resurrection of His Son, our Lord and Savior, Jesus Christ, is the whole point! How Does God Use The Ten Commandments In Our Lives? You have this law to see therein, that you have not been free from sin, but also that you clearly see, how pure toward God should be. Have mercy, Lord! Lord Jesus, help us in our need; Christ, you are our go-between indeed. Our works, how sinful, marred, unjust. Christ, you are our one hope and trust. Have mercy, Lord! The Ten Commandments cause us to ask ourselves the following questions: Do I fear, love and trust in anything or anyone above the Triune God? Have I honored the Lord’s name on my lips and in my life? Have I gladly held His Word sacred, listened attentively to the preaching of that Word, and made use of it in my daily life? Have I honored and obeyed all the authorities placed over me? Have I maintained the purity of my marriage and my sexual life in my thoughts, words and deeds? Have I stolen property or not helped my neighbor protect his? Have I gossiped, either by listening to it, or spreading it myself? Have I been content with all that the Lord has given to me? The Law is a blinding reflection of our sin. The Law of God is what the Holy Spirit uses to make us realize how much we need the forgiveness Christ won for the world and now distributes through His Word and Sacraments. The Holy Spirit calls us by the Gospel, to turn to Christ Jesus, who is our only hope, for He has fulfilled the Law perfectly for us and died so that our sin would be forgiven. Through His resurrection from death, He conquered death. In Christ, we have been adopted as the Lord’s own dear children. Therefore, God uses His Law in three ways: First, like a curb, by which outbursts of sin are controlled. Second, and most importantly, like a mirror, to show us our sin and our need for a Savior. And then, like a guide, to teach us what is pleasing to Him. Living in the forgiveness won by Christ, throughout our lives we pray, "Have mercy, Lord!" The Law and the Gospel do not stand in opposition to each other as if they are rival systems of salvation (see Galatians 3:15-29). Scripture, which contains God's Law, incarcerated the whole world with no hope for release. Sin's dreadful power subjugated all of human existence. The Law discloses sin for what it really is -- a violation of God's revealed will. Therefore, the Law does have a purpose in God's plan, which is to simply show us our need for deliverance from the wages of our sins (Romans 6:23). The Law serves the good purpose of revealing our sin and our need for a Savior. The good news? Christ redeems us from the Law's curse by becoming a curse for us! One sin, no matter how "trivial" it may seem to us, makes us a transgressor of the whole Law and accountable to God (James 2:10). Christ's death on the cross releases us from the guilt of every sin. So, the 10 Commandments show us our sins and preach repentance; that is, by them God shows us our sin and how much we need a Savior. In a Lutheran layman's terms, the Law is good and necessary, but Jesus Christ does for us what the Law cannot do -- He gives us forgiveness of sin and eternal life though we did not deserve it one bit.